Nō is a stylised dance-drama in which actors wear elaborate costumes and wooden masks. In contrast to kabuki which began as street entertainment, nō has its origins in temple ritual and has long been considered an aristocratic art form, enjoyed by shogunate and samurai nobility. 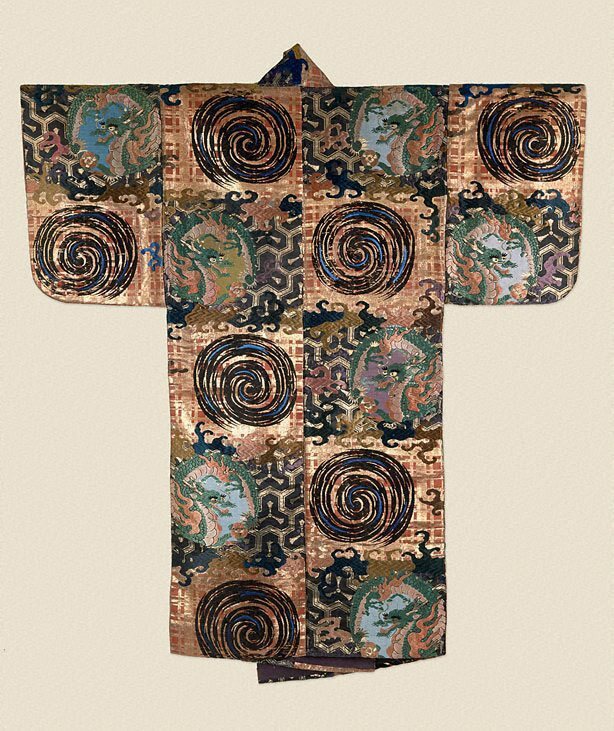 Nō robes reflect the rich clothing of its traditional warrior-class patrons and are produced using expensive materials and complex techniques. With its vibrant design of expressive dragons in roundels against a stylised tortoiseshell pattern ‘bishamon-kikkō’ and fluid whirlpool ‘uzumaki’ motifs, this robe would most likely have been worn as an outer garment by an actor playing a male role.